New York City is the largest metropolis in the U.S., and as such it has something for everyone. Not only can you find landmarks in nearly every neighborhood, but you can also view areas of natural beauty and experience unique amenities for each and any taste. But how to sift through the magnitude of New York–how to distill all that it has to offer and discern what exactly will make yours a worthwhile visit? To do so requires someone who can navigate both the streets and the attractions, and for that you need Sights by Sam. With smaller tour sizes and manageable routes, our company can provide an individual experience of New York both by helping guests discover particular areas of the city and by tailoring such discoveries to their specific interests and desires. 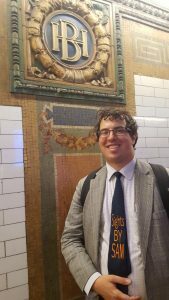 Most important, Sam’s breadth and depth of knowledge ranges from more than the Hudson to the East rivers–he can provide an understanding of New York’s people, buildings, infrastructure and history that illuminate the city’s culture and past in an informative, inspiring light. For first-time travelers as well as life-long residents, you have not seen New York until you have seen it with Sights by Sam.